The Star Trek intro says, 'Space: the final frontier'—but what about the seas? Mysterious, inhospitable, full of untapped resources, surely the oceans are our final frontier; and divers, like astronauts, have 'the right stuff'. 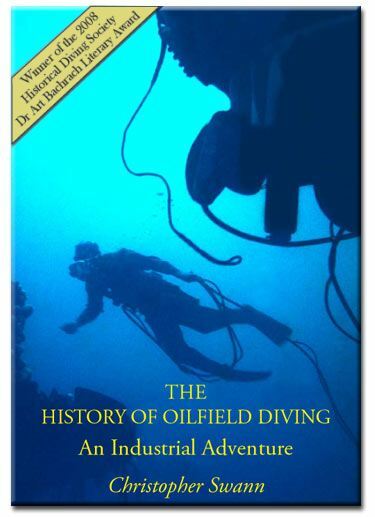 The History of Oilfield Diving chronicles one of the greatest adventures of the 20th Century. A story of human endeavour, physical danger and breakneck technological development, this is the most comprehensive account of oilfield diving ever written. Until the 1950s there was no oilfield diving industry. Some people dived for fun. The few men who dived for a living fished for abalone or plied their trade in harbours and dockyards, on civil engineering projects and on the occasional salvage project. Nearly all the work was in shallow water. As a result, there was little innovation in either equipment or techniques. As oil was found at greater depths, all that changed. In the early 1960s, the oil companies drilling off the coast of California were pushing the limits of traditional commercial diving. All their exploratory wells were in 200-250 feet of water, a depth at which nitrogen narcosis becomes a serious limitation. Progress into still deeper water was about to come to a halt. Until, that is, a former US Marine, who made a precarious living diving for abalone, mounted a scuba regulator in an abalone helmet, bought some helium from a hospital supply company and dived to 400 feet. Within days, he had a work order to put a set of helium gear on a drilling vessel. Two years later, his company became the nucleus of the world's first industrial diving concern. And the rest, as they say, is history: a history meticulously chronicled, with superb illustrations, many of which have never been published before. Like any good historical work, this book is packed with exciting stories. Fortunes gained and lost, dazzling innovations, tragic death, heroic rescue, battles with officialdom …you can find all those, and more—together with an exceptionally comprehensive index to enable readers and researchers to find exactly what they are looking for.